St. Anthony’s College is a struggling Catholic university run by sweet old Father Burke, who’s getting to be as decrepit as the school itself. The powers-that-be want to close his beloved St. Anthony’s, seeing how the school’s $170,000 in debt, but old Father Burke comes up with an idea. 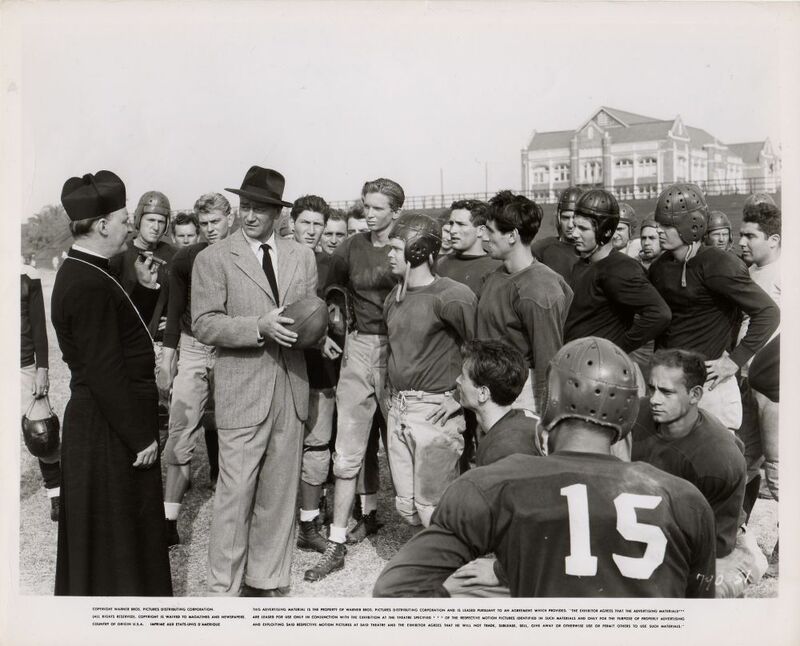 Citing Deuteronomy 32:15 (“The beloved grew fat and kicked”), the padre decides what St. Anthony’s needs is a winning football program, and sets about to hire a new coach. This leads him to a pool hall, where he finds Steve Williams, a hard-drinking ex-coach, part-time bookie and ladies man banned from the sport for recruitment violations. Steve’s down on his luck, and his cheating ex-wife Ann is trying to gain custody of their daughter Carole out of pure spite. Pretty but no-nonsense child welfare officer Alice Singleton is sent to Steve’s humble hovel to investigate, and the free-spirited Steve finds himself at odds with the all-business Miss Singleton. 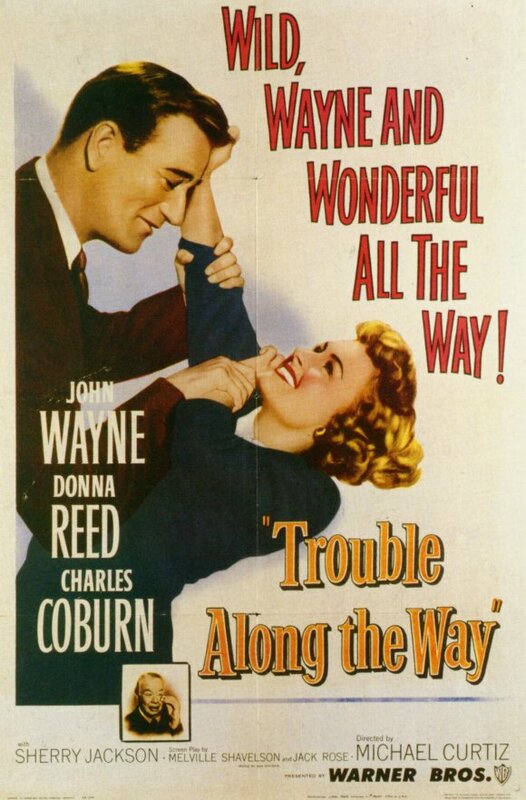 TROUBLE ALONG THE WAY is a gentle, sentimental tale with Wayne likeable as the not-so-honest but well-meaning coach. 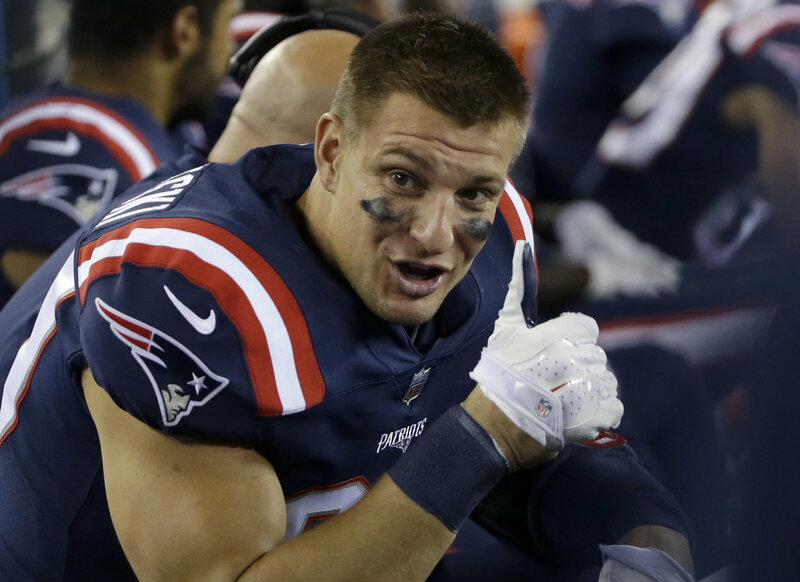 Duke knew a thing or two about football, having played for USC, and makes Steve a totally believable character. He’s a loving father to Sherry Jackson’s Carole, and the two have an undeniable chemistry (Wayne always seems to work well with kids). 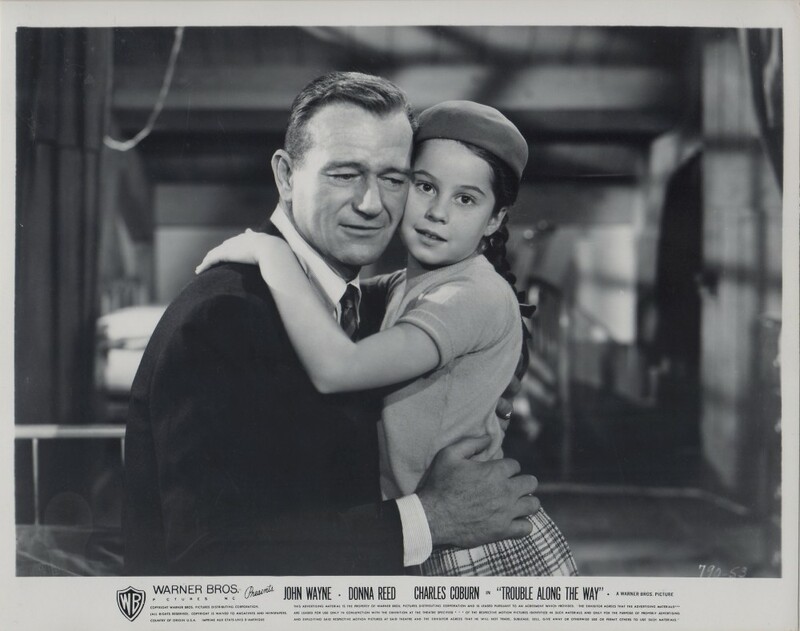 Jackson went on to costar in the Danny Thomas sitcom MAKE ROOM FOR DADDY, and a bunch of episodic TV and low-budget films (WILD ON THE BEACH, THE MIN-SKIRT MOB, THE MONITORS) followed. 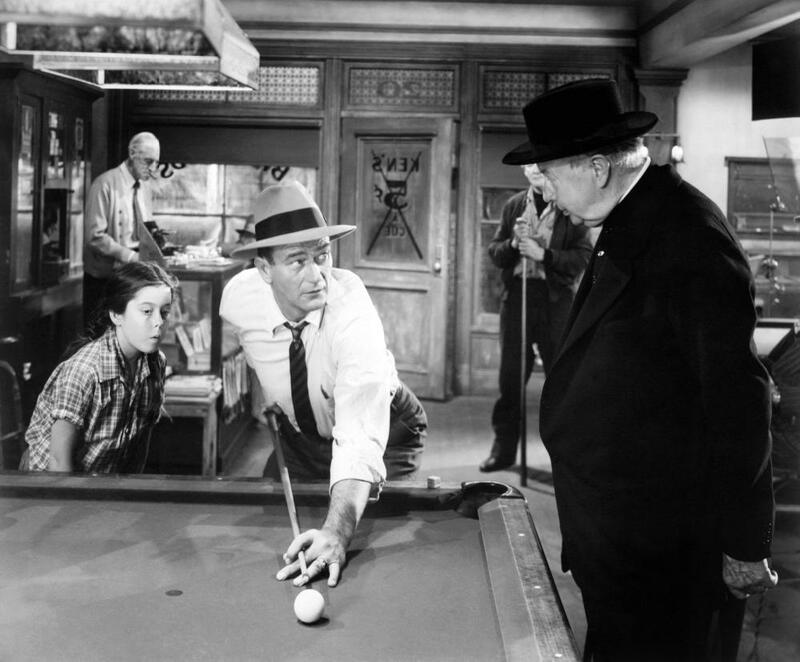 Veteran Charles Coburn plays the warm Father Burke in his own inimitable style. Donna Reed is welfare officer Alice, and you know she’s gonna end up with Duke by film’s end. 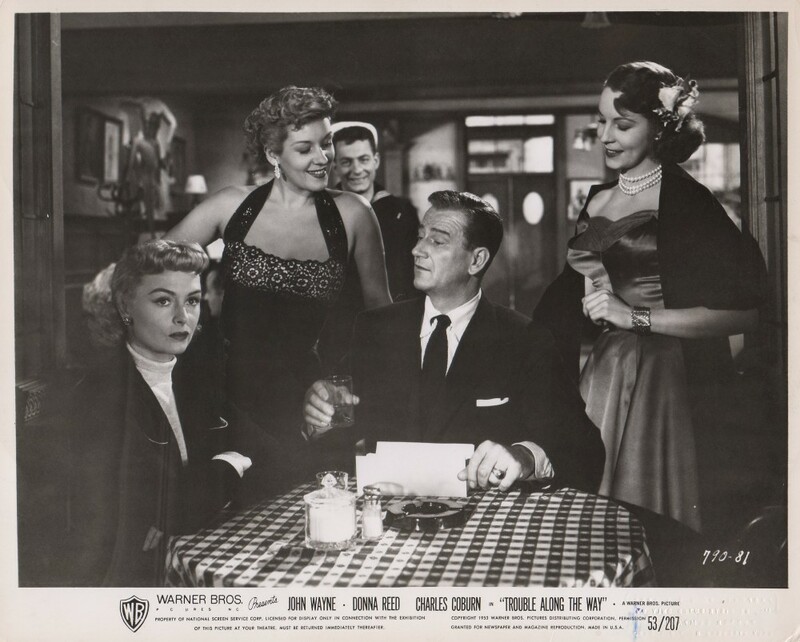 Noir dame Marie Windsor is the spiteful Ann, and the rest of the cast includes a young, crew-cutted Chuck Connors as one of Steve’s assistant coaches, Frank Ferguson, Dabbs Greer , Ned Glass, Lester Matthews , Olan Soule, and Tom Tully. Familiar Face spotters will want to keep a sharp eye out for James Dean as a spectator during the big game. 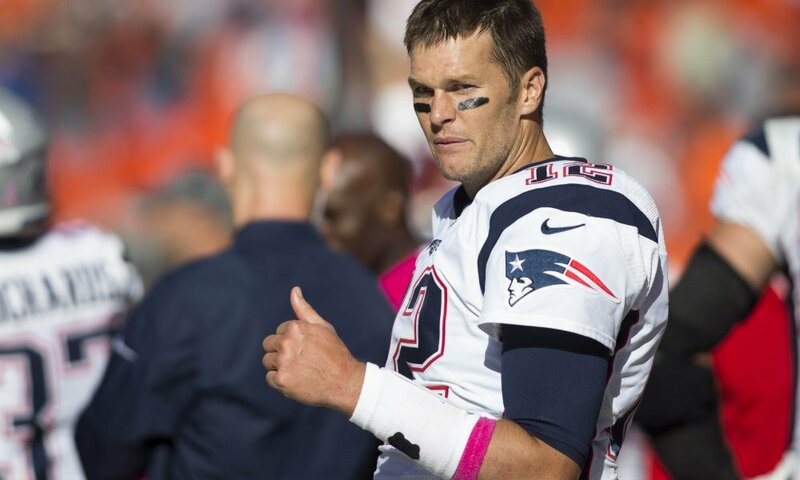 All together now: LET’S GO PATRIOTS! !